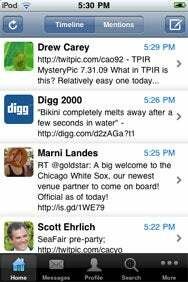 The latest trend in Twitter apps for iPhone centers on push notifications that take advantage of the iPhone OS 3.0 update. With push, you can know instantly when someone mentions you or sends you a direct message on Twitter, even if you’re busy playing Baseball Slugger when it happens. Give It a Push: Boxcar’s sole raison d'etre is to notify you when you get direct messages or mentions in Twitter. Boxcar, a $3 app from Appremix, isn’t meant to replace your main iPhone Twitter client. Rather, it’s a standalone app exclusively for handling push notifications. You login to your Twitter account, and grant the app privileges via OAuth (meaning you needn’t expose your password to Boxcar), and that’s it. Boxcar lets you control whether you receive notifications for direct messages and mentions separately. You’re able to configure which Twitter app on your iPhone should launch when notifications arrive; the app integrates with Tweetie, Twitterrific, TwitterFon, Twittelator, and Twinkle. You can also choose to have direct messages open within Boxcar itself; the app sports an iChat-esque interface which works capably, though I see no reason not to handle all my tweeting from within my main Twitter app of choice. I found that notifications arrived within less than two minutes of the original tweet. Boxcar does what it says on the tin, and I’m happy with it. Push Comes to Shove: Like Boxcar, Tweet Push notifies you of direct messages and mentions. But there’s a monthly fee involved. Tweet Push, a $1 app from Polar Bear Farm, is a direct Boxcar competitor, but pales in comparison. Don’t be fooled by the initial price tag: Long-term use of Tweet Push will cost you decidedly more than Boxcar’s asking price. That’s because Tweet Push requires a monthly fee of 99 cents to keep the notifications coming. You can purchase credits from within the app using the in-app purchase feature added by Apple with the iPhone 3.0 software update. Not surprisingly, you’ll need to create an account within Tweet Push to make things work. And since Tweet Push doesn’t consider OAuth ready for prime time, you must provide your Twitter login credentials to the app. Tweet Push integrates with a number of different clients: Twitterrific, Tweetie, Twittelator, Twitterfon, Twinkle, and SimplyTweet; the developer plans to add support for Birdfeed soon. Unlike Boxcar, the app also lets you receive notifications every time someone you’re following tweets—but frankly if you want to turn that on, you’re a crazy person. The sole Tweet Push nicety that I really miss in Boxcar is the ability to set up “quiet time” (from the Web site), during which hours the app won’t send you notifications. In addition to these self-contained push notifiers, more full Twitter clients are incorporating push into their apps as well. Among them is Twitbit, a $5 app from High Order Bit. First, it must be noted that Twitbit’s icon is unequivocally awesome. Fortunately, the pleasant experience continues when you actually launch the app. Like Boxcar, Twitbit uses OAuth to log you into your Twitter account. As a Twitter client, it’s quite good, but not quite great. All the key features—multiple account support, favoriting, retweeting, and the like—are supported. And the app includes a personal beloved feature of mine—the ability to tap into another member’s favorites. You can compose tweets in landscape mode, and the in-app web browser works in landscape too, which is a very nice touch. Scrolling is smooth. 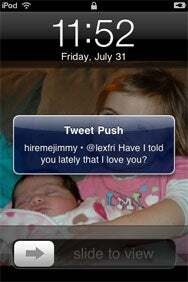 All This, and Push, Too: The Twitter client Twitbit not only features push notifications but also supports key features such as multiple accounts, favoriting, and retweeting. My biggest knock against Twitbit is that I don’t love its look. I find the gray bar between each tweet distracting, and I wish I could choose a different, more subtle theme instead. On the push side, Twitbit works okay. In my testing, its notifications generally arrived a minute or two after Boxcar and TweetPush had signaled me, but that’s not a huge deal. More annoying was that the app beeps again to notify me a second time when I launch it, after the notification already did so. Again as in Boxcar, you can choose to be notified for mentions, direct messages, or both. As of now, I’m sticking with Tweetie and Boxcar; I love the elegance of the former and the unobtrusiveness of the latter. If Boxcar weren’t there to bridge the push gap, or if I weren’t so enamored of Tweetie’s interface, I’m confident I could be very comfortable with Twitbit. All three apps are compatible with any iPhone or iPod touch running the iPhone 3.0 software update. An earlier version of this review misstated how you purchase credits with Tweet Push and what Twitter clients the app integrates with; those errors have been corrected, and we've adjusted the app’s rating to .